Some Amish companies spend a good bit of cash on advertising. 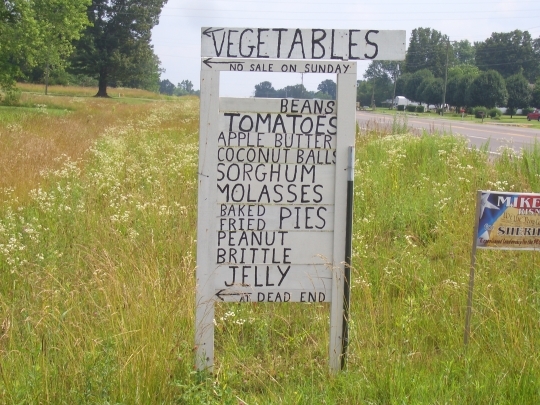 But for many, the simple roadside sign is the furthest extent of their self-promotion. I’ve collected a few examples from around the country here. I wonder if you can tell which communities these are from. There are 7 states represented in the 10 photos below. These images give you a sense of the range of Amish business–including the varying size and industries. Who knows, you may have even been to some of these businesses. 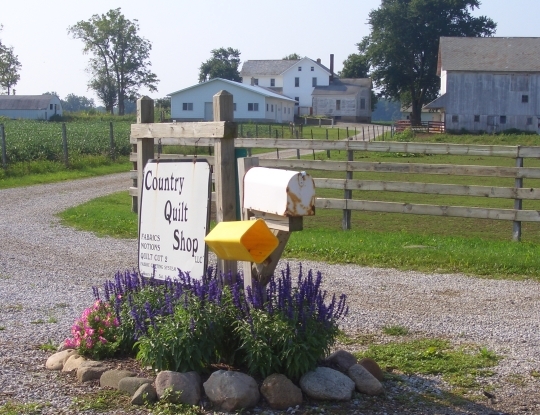 For more, check out this little piece on typical Amish businesses. Is the first picture located in Indiana. Either Shipshawana or LaGrange ? You’re very close Barbara. That’s actually Nappanee area. I’ve definitely seen the second one before, or else a nearly identical one. Maybe Ethridge, TN? Bingo! That might be my favorite one here. Just something about it. Heather there used to be Amish in Oregon dating back to the 1800s but no longer. 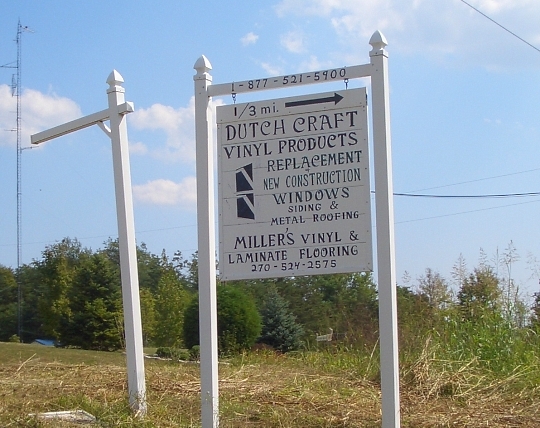 I can’t say I know where any of them are located but I have always been a fan of quality wooden signs and the Amish do an excellent job. 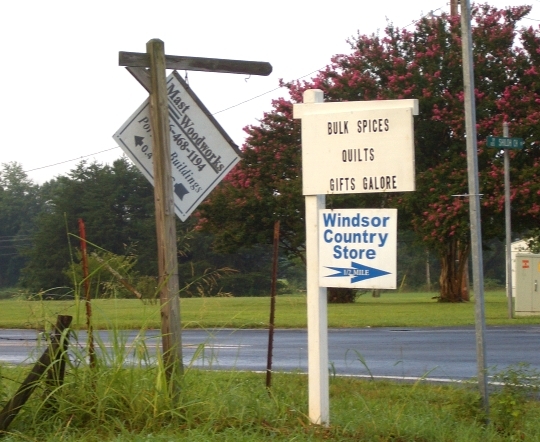 As far as the one of Windsor Country Store, I must admit, I could not have resisted the temptation to restore the sign to it’s full hanging position. That is correct Forest, nice job. 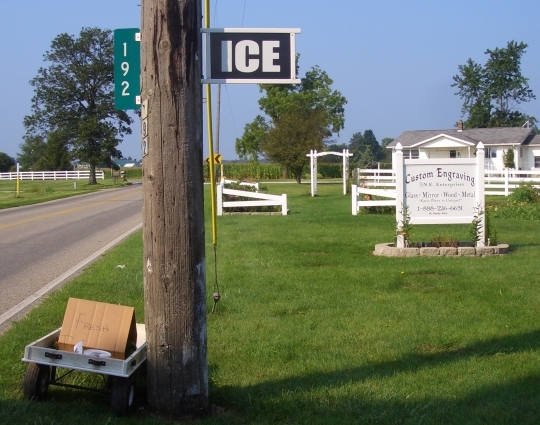 I notice that none of the signs indicated specifically that the businesses are Amish. Thoughts on that, anyone? sign looks like one I’ve seen in the Sonora/Upton, Ky. area. one looks like the Arthur, Ill. area. like the signs I’ve seen in the Orange Co. Ind. Swartz. settlement. It’s interesting to see the difference in signs in Swartz. signs in higher order settlements like Shipshewana. guess where the pictures came from. Wow Al, nice job! You are 4 for 5 on your guesses. 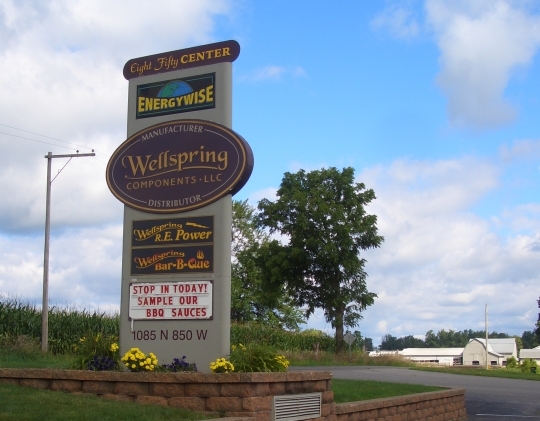 The only one you were off on was the 5th which is actually also a Nappanee sign. 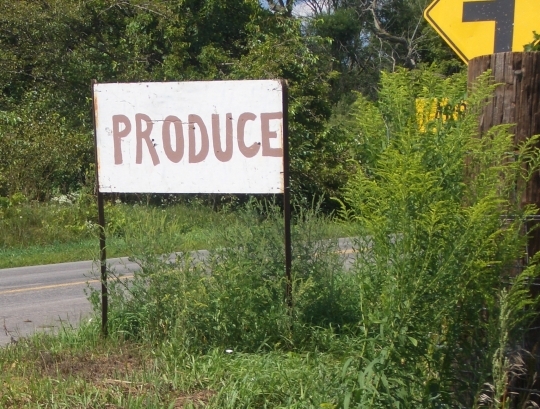 I was impressed you got the Hardin County KY Produce sign right. There is a big difference in these signs, quite a contrast in some of them as you note (ie #9 and 10). Looks like the only ones left un-guessed are #3 and #6. Chelsea, that is right, it is from the Holmes/Wayne community. I am almost 100% sure this was in Wayne Co, but cannot remember if it is on the border or not. I understand that the Amish will not use the word “Amish” to advertise or name a business. They consider it prideful. In fact any business calling itself “Amish” is almost certainly run by non-Amish, althoguh it might count Amish workers amongst its employees. On the other hand, the Amish don’t seem to mind others using the word “Amish” to promote a business. In this age of strong copyright and trademark laws, and high-profile disputes over brand names, the Amish attitude towards their own name is refreshing. 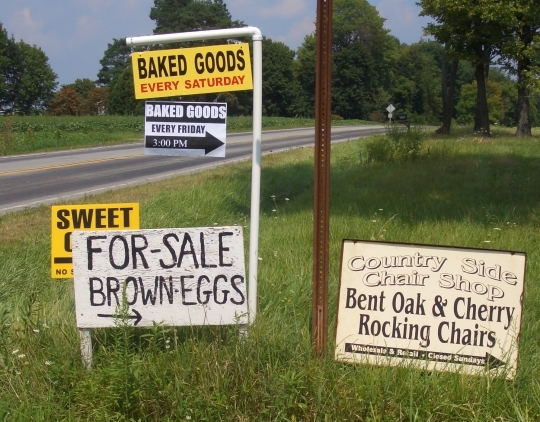 Paradoxically, it makes it somewhat easier to identify a “real” Amish business — just look past those trumpeting the word “Amish” and look for a handmade sign! Exactly right Adair. The only one that hasn’t been guessed is #6. A hint: this state hasn’t been mentioned yet. Would the fourth sign be from Berne IN? Amish who have the word Amish in signage for their business located in Geauga Co., Ohio but it is rare. 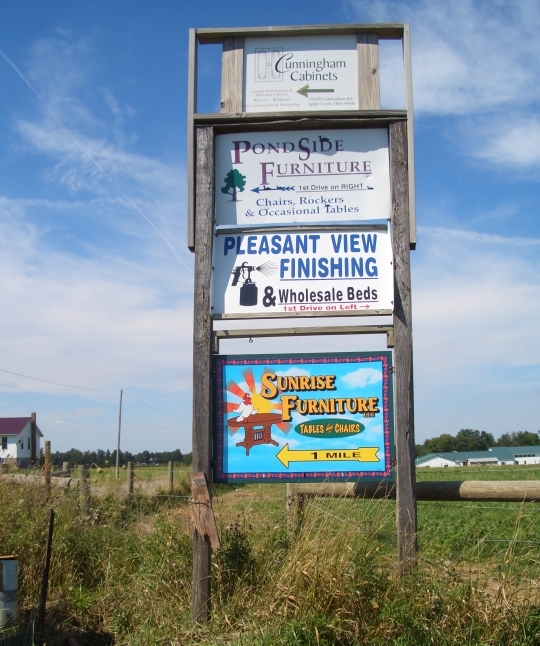 There are also many Amish owned business that do not have signs and thus you must know where they are located. When I asked my taxi customers why, they listed a couple reasons – Some church districts evidently limit signs, sizes and placement. The most frequent reason seems to be that these business are very Amish oriented (used clothing, fabric, bulk food for example) and don’t want to attract interest from tourists. Eric, I have always found the Amish in retail establishments (with signs or without) to be open and friendly. I have been in one unsigned Amish used clothing resale shop but have not gone into any others. Not that I didn’t feel welcome but even though I dress conservatively I don’t ewear “Amish” style dresses so I feel that if I go in and poke around I’m a lookie-loo and I feel that is disrespectful. My personal feelings, not something anyone has ever indicated to me. Ann that is an interesting response, I think you are right it is generally the case that Amish business owners like other businesspeople are accommodating to visitors. 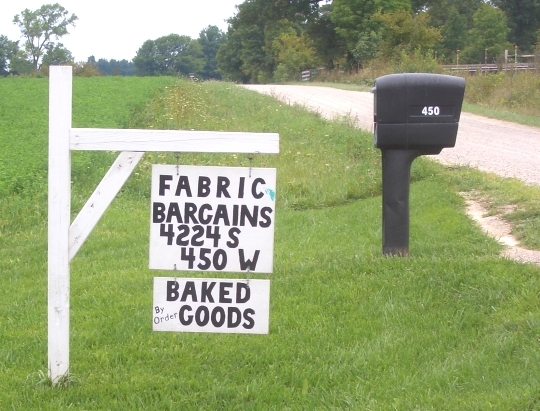 For sign #6 I’ll guess St. Joseph or Branch County, Michigan (or somewhere else in Michigan). It’s a good guess Al, this is actually in PA. Either way I’m impressed by the collective knowledge of these signs!